A myriad of unique species evolved on these isolated islands. Many have disappeared, victims of other species introduced willfully or accidentally, decimated by new-to-them diseases, or simply displaced by the relentless encroachment of humans. Of those that still survive, many are under great threat. However, there are success stories. Nēnē, the state bird, have come back from almost nothing and are doing well. Some ‘amakihi appear to have developed resistance to avian malaria, and ‘alalā, the Hawaiian crow, have recently been reintroduced into the wild in small numbers in an attempt to reestablish a wild population. 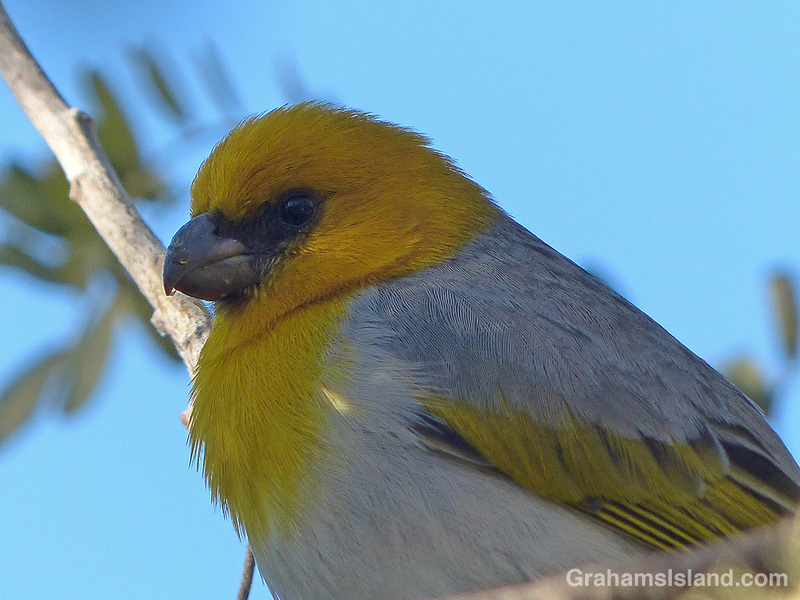 The palila is another endemic species that is rebounding with a little help. It is the only one of 16 finch-billed honeycreepers still in existence. It used to live on the islands of O’ahu, Kaua’i and Hawai’i. Today it exists only on Hawai’i, the Big Island. Even here, it’s habitat, which once covered the māmane forests of Mauna Kea, Hualali and Mauna Loa, has been reduced to a small area on the southwestern slopes of Mauna Kea. 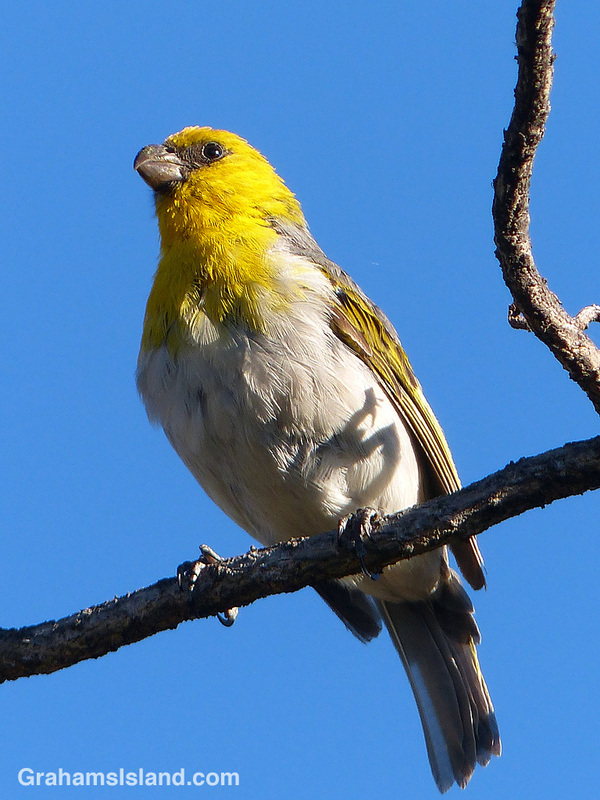 The palila is a specialist feeder and this is one of the reasons it’s in trouble. 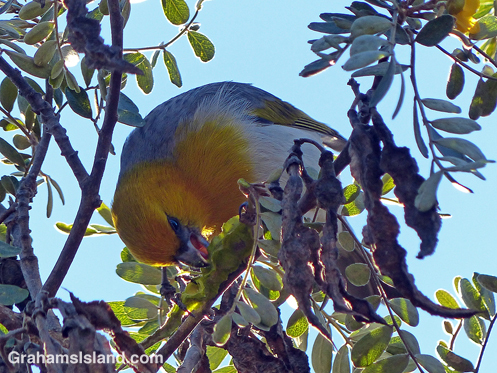 It feeds mostly on immature seeds of the māmane, but māmanes have been badly affected by agricultural expansion and by grazing by wild sheep and goats. The Palila Forest Discovery Trail is an area that has been fenced off and is protected from these threats. I’d been up there several times (four-wheel drive required) but had never caught so much as a glimpse of a palila. One of the reasons for their elusiveness is that palilas follow their food. Māmane flowers at different times depending on the elevation, so palila move up and down the hillside as the flowers bloom and the seeds reach the state they prefer. Last time I was up there, however, my luck changed. I was taking photos of a moth when something flashed by just above me. I looked round and sitting on a nearby branch was a palila (I’m not a birder, but they’re quite distinctive.). I quickly snapped a few photos, desperate to get some kind of record of this elusive bird before it disappeared. I needn’t have worried. It seemed unconcerned by my presence and was soon joined by several others. What was most striking was their feeding habit. A palila would pluck a green seed pod and take it to another branch. Once it was settled, the reason for its it stocky bill became apparent. It absolutely hammered at the pod, pinning it to the branch and banging away with its beak to access the seeds. The image of a workman smashing concrete with a pneumatic drill popped into my mind. For half an hour or so I got to watch them at work. They seemed much like other birds I see — lively, healthy, a thriving group. But looking around, it was a sobering thought to realize I could see all their habitat, containing all that is left of an entire species. 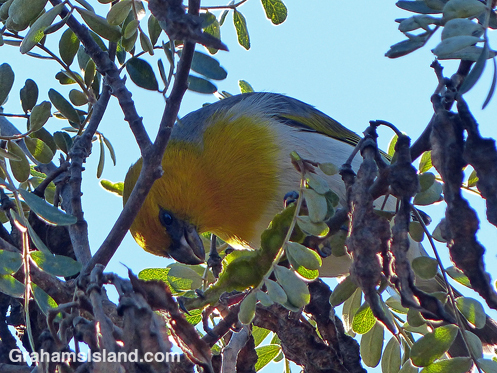 For more information about birding on the Big Island, go to http://hawaiibirdingtrails.hawaii.gov/.